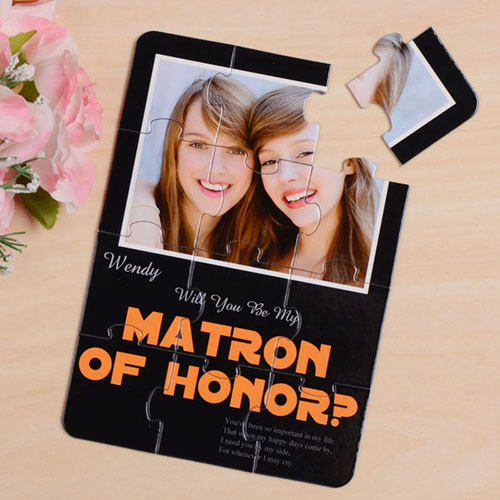 Let your party guests pieces together your wedding news using this personalized wedding puzzle invites or wedding announcement puzzles. 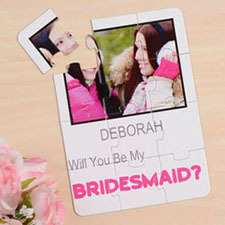 Make your wedding party puzzle invitations online using our online picture editing tools is easy and fun. Simply upload photo to our website, and use the online tools to insert photo. Double click on the photo for the picture editing toolbar to appear, you can then crop, rotate or resize the photo the way you want. You can even add custom message on the puzzle invites using the tools. With the instant preview feature of our editing tools, you can see an instant full color preview of your personalization before placing order. 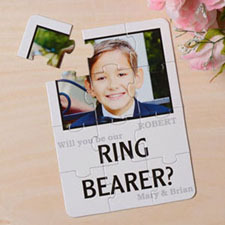 Each 5 x 7 custom invitation puzzle includes 12 puzzle pieces comes unassembled seal in a plastic bag. A separated free envelope for each puzzle is provided. 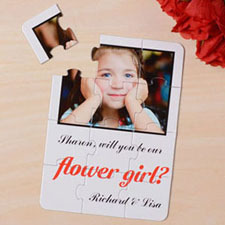 Custom puzzles invitation work great as wedding announcements, bridal shower invitation, save the date puzzle and cheap wedding party favors.